These boutiques are a must visit, not only are her stores beautifully set out, the clothing is to die for. Paris born fashion designer, Magali Pascal studied and graduated from École Nationale Supérieure des Arts Décoratifs, the respected decorative art school of Paris. MAGALI PASCAL has produced easy-to-wear pieces that embodies French elegance in its high-end design. Inspired by the Parisian "Bourgeois Boheme" effortless chic spirit, her collections are recognisable in their feminine, vintage aesthetic and the earthy colour pallets. Reflecting an urban vintage mind with a French flair, Magali favours the use of luxurious silks, laces and organic fabrics with refined hard wear and beaded embellishments. With each new collection, you can expect to find original and effortlessly feminine additions to your wardrobe. What's even better is all her pieces are locally handcrafted in Bali. is a one-stop lifestyle shop in Bali. Located in the savvy district of Seminyak, it offers up a chic selection of hats, bags and accessories and it has a little something for everyone. From fab fashion items to homeware, artwork, linens, gifts and jewelry - it may be a good idea to travel to Bali with your suitcase half packed! Toko Emporium supports local artists and crafts and stocks 100% locally produced items (double like.) The staff at Toko Emporium are extremely welcoming and knowledgeable and they also have a man-sofa for weary husbands. Uma and Leopold's creations are timeless, feminine and handcrafted. Their designs have a supreme ability of giving classical shapes and design a modern twist with original handcrafted details, noble materials and textures. Each piece is unique, one of a kind and can take a month for creation. Crafted by handpicked, gifted local artisans, the delicate beading and meticulous details reflect the brand’s unique handmade techniques. The use of diverse handwork techniques as Kerawang art, embroidery, hand beading and leather weaving reflect the brand’s signature. Mercredi channels “tropical beach house” without the need to whitewash your living room as per “shabby boat house chic”. Let’s face it, we’re over the distressed look and a predictable colour pallete anyway. Check out the great range of bright neutral fabrics, deep wood furniture accessories, handblown glass ornaments and modern tapestries at this gorgeous homewares boutique. NON-TYPE is the latest creation in the long history of design and fashion for its two founding members Gareth Moody and George Gorrow, it represents a coming of age, being their first release as a creative partnership since their world renowned and iconic label Ksubi. The line is a morphing of genres, NON-TYPE suggests no fixed genre, and a non-type rating, an open door with a license to roam across all aspects and fields of apparel, not limited to fashion and lifestyle but equally comfortable, touching on the luxury surf world, from leather blazers, tailored wool trousers, linen suiting, to tailored board shorts and surf skins. The labels first flagship store has recently been opened in collaboration with THE SLOW The collection is sold exclusively via its flagship store ( Room 14 at The Slow ) and will be available online later this year. 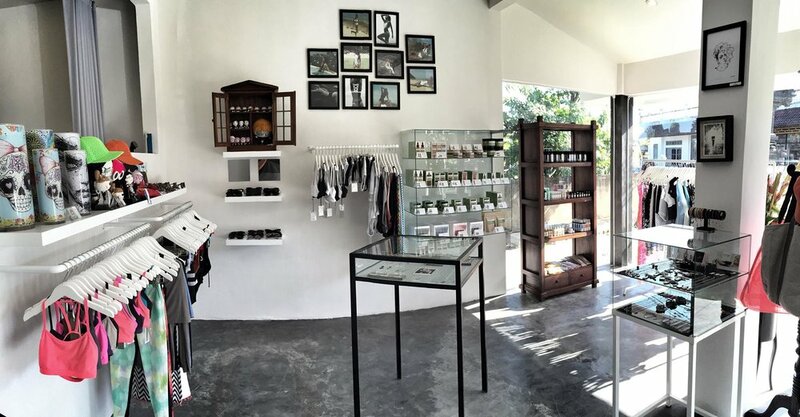 The offering is a multi label boutique in Canggu, Bali offering the best international products manufactured locally. The offering showcases skin care, active wear, swim wear, home wear, ready to wear, accessories and footwear for both men and women. located in the heart of Canggu on popular Jalan Pantai Batu Bolong. Les Basics is a one stop shop for all your holiday fashion essentials. They stock a great range of basics for everyday where and they stock June swimwear and Lack of Color hats too. An edgy concept store in Canggu that tends towards the dark and monochrome aesthetic. The stock range is filled with Bali’s cutting edge brands. If the colour black and leather are your thing, this is your place. There is nothing island resort about this shop. Cushions, homewares, bags, Bungalow Living has it all. A beautifully curated homewares selection displayed rather perfectly in a store that you might get lost in for some time. If you’d like to add a hint of Balinese-inspired décor into your abode, it is essential to explore the luxurious homewares that Bungalow Living has to offer. Take it all in while enjoying a coffee at its very own café.